PennHIP EVALUATION PennHIP stands for the University of Pennsylvania Hip Improvement Program. PennHIP is a multifaceted radiographic technology (X-ray) for hip evaluation. The technique assesses the quality of the canine hip and quantitatively measures canine hip joint laxity. The PennHIP method of evaluation is more accurate than the current standard in its ability to predict the onset of osteoarthritis. Osteoarthritis, also known as degenerative joint disease (DJD), is the hallmark of canine hip dysplasia (CHD). Only specially trained radiologists can perform this evaluation procedure. 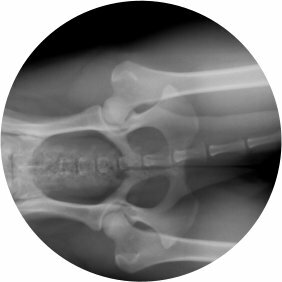 ARTHRITIS & DEGENERATIVE DISEASES Tri-County Veterinary Hospital offers comprehensive diagnostic and treatment options for orthopedic and degenerative problems your pet may be experiencing. Our doctors will apprise you of the many orthopedic surgical procedures and medications currently available to help restore your pet's mobility. MICROCHIP LOCATION TECHNOLOGY Every day a beloved family pet is lost. Tragically, most never make it back home because their owners didn't identify them. The MicroChip is the professional way to identify your pet and is proven safe and effective. In addition to microchipping your pet, we also register your pet's microchip at no additional cost. A small chip, the size of a rice grain, is injected under the skin of your pet. The procedure is very safe, very similar to getting a vaccination. The chip is encoded with a unique I.D. number that is registered to you. If your pet ever gets lost and is brought to an animal shelter or clinic, they are scanned to see if they have a microchip. 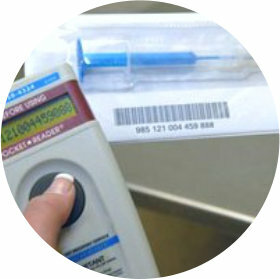 If a microchip is found, the number is submitted to a national data base center which is called to locate the owner. Just like a vaccination, it is injected under the skin of your pet where it remains safely for life. This inexpensive procedure can be done anytime and protects virtually any pet in your household.